Few spices can excite your taste buds as powerfully as cardamom. Have you ever noticed how someone will take a bite of a cardamom-laced dessert, declare instant love, yet not be able to identify the spice? That's because cardamom is enigmatic. Think about it: Is it spicy or sweet? Citric or floral? Does it taste like lemon? Cinnamon? Anise? Christmas? Yes. Cardamom embodies all of these flavors in one glorious spice, which is why baking with cardamom is so popular. 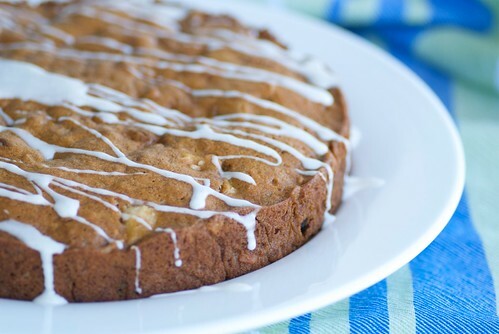 As this Banana Apple Cardamom Cake bakes, it will permeate your home with the sweet and spicy aromas of cardamom, nutmeg, ginger, and coconut. With mashed ripe bananas, butter, and coconut milk, this is an especially moist cake that is punctuated with bits of chewy raisins, crisp apples, and crunchy nuts. It makes a sweet start to the day when paired with a mug of hot coffee or a relaxing afternoon snack with a cup of tea or a glass of milk. It also has the added benefit of tasting even better the next day. 1. Place rack in center of oven and preheat to 350 degrees F. Butter or coat with cooking two (9 X 2-inch) round cake pans. 2. In a medium size bowl, whisk the flour, baking soda, salt, cardamom, cinnamon, nutmeg, and ground ginger. 3. In a large bowl, beat the butter until creamy. Add the sugars and beat at medium speed for a couple of minutes. Add eggs and beat well. Add the honey, vanilla, and coconut milk, and beat until batter is silky. Lower the speed, add the bananas, and beat briefly. 4. Add the dry ingredients to the liquid ingredients, and mix until just incorporated. Using a rubber spatula, gently stir in the apples, raisins, coconut, and nuts. Divide the batter evenly between the pans. 5. Bake for 40 minutes, or until the cakes are a deep golden brown. You'll know they're done when a toothpick or cake tester inserted in the middle comes out clean. Transfer the cakes to a rack and let cool for 10 minutes before removing from pans. 6. Meanwhile, make the icing in a small bowl by whisking together confectioners' sugar and cardamom. Add a few droplets of milk and continue whisking until the icing is smooth and thin yet clings to the back of a spoon. When it's ready, pour it through a fine-mesh sieve to remove any tiny clumps of confectioners' sugar. 7. Invert cakes onto a rack, then turn right side up. Using a spoon, drizzle the icing over the top of the cakes, and spread it with a thin, metal spatula. Sprinkle each cake with 1/4 cup of toasted coconut, and 1 tablespoon chopped pistachios. Allow to set for at least 15 minutes before slicing. Love all the spices you have added in the cake. I love cardamom too, ifcourse we use them a lot in indian cooking, i even add them in my pot of tea. Now banana, apple and cardamom is an interesting combination - beautiful! I am ready for a little mystery un my baking Susan. I love all the flavors that are in this cake. For a small family this is the perfect size! I've been a fan of cardamom for years. I've made scones with mango and cardamom that are delicious and just recently came across chocolate with cardamom that was captivating. This looks wonderful! I love cardamom and this cake sounds right up my alley. It looks absolutely delicious! Indeed, cardamom is an interesting spice. This combo is wonederful. I'm sure this cake taste extremely good! Oh this just sounds fantastic. I love trying out new recipes that are different from what I normally bake. Thanks for posting this Susan. I will definitely give this a try! I love cardamom and hope to try this soon. Looks fantastic! I love the clean, satisfying flavors of apples and bananas. I can't believe I've never combined them before. (Never chewed a cardamom pod either yet, though.) Lovely recipe, Susan. I love the flavours in your cake, Susan. And its got my "favouritest" spice in the world. Yes! Perfect! I bought a bunch of cardamom in Hawaii for super cheap. I needed some new recipes to use some of it up. interesting recipe. I like cardamon :) and in this cake must be delicious ! So loving the flavors here! LOVE cardamom! i need to cook/bake with it more. Looks fantastic! I love combining cardamom with the warm spices, like cinnamon. The aroma is intoxicating and the flavor comforting -- what could be better? But I also love Swedish cardamom bread, where the cardamom is the star. I think I love you. I could totally convert this to gluten-free. I think I might just do that. I can imagine the aroma right now! happycook-I absolutely love your tea idea and will try it when I'm back home. Thank you! TW-They work well together, indeed. val-Then you just met your mystery spice. kate-Mango and cardamom scones? Oh, my, I have to get that recipe! teachercooks-It is a nice size. rosa-It really is wonderful. Thanks! debbie-Then I think you'll have fun with this recipe. mark-They are clean and satisfying flavors, aren't they? Thanks! sarah-Oh, that cardamom must be lovely. Enjoy! carolyn-I'm so happy you like it. lydia-Swedish cardamom bread? Now, that's a bread I have to meet. your description and picture is making my mouth water. I actually happen to love cardamom, so this recipe if for me - I have to make that icing! I love cardamon tooo, sometimes I use it in my donuts recipe and the result is fantastic! I have a tendency to think of cardamom as the umami of the baking world. You can tell it's there, doing magical things, but you can't quite put your finger on what it is. This cake sounds amazing. I lvoe teh fruit included in it. This sounds fabulous! So many delicious flavours going on. I have to say... I never thought of myself as a "tropical flavors" kind of gal but this cake has become an absolute favorite. This is the second time I've made it - the first time, I was going to a potluck and halved the recipe and everyone got mad at me for not bringing two cakes! One change that I think is really delicious though... I have been making the glaze with 1 cup of powdered sugar, 1/2 t cardamom, the juice of 1/2 a lime, and a dash of dark rum. Ammmmmmmmazing. Adds the perfect tang to the cake. Thanks for this recipe!